I’ve been fairly quiet on social media recently, partly because I needed to recharge my batteries in that respect (it was all getting a bit much, you know? ), but also: I’ve been really concentrating on my writing. The two pieces of flash fiction I said had been accepted in my March update have now both come out – one micro piece in issue two of the Bangor Literary Journal, and a brand new short story in issue nine of Corncrake Magazine. 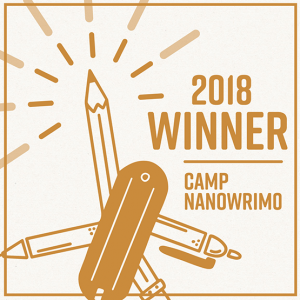 I finished and won CampNaNoWriMo, writing 20,000 words during the month of April. But, most importantly, I have finished my novel!!! (Yes, those extra exclamation marks are necessary. Didn’t you hear what I said?) I don’t mean I’ve finished the first draft – oh, no. We’re way past that! – I’ve sent the whole thing out to my beta readers and finished a round of edits. I had a meeting with a writing mentor on Friday who looked over my pitch and first 10,000 words and she was so positive about it, encouraging me to not delay in sending it out. So, that’s exactly what I’m doing. My novel will be in the inbox of an agent come morning! Congratulations Ellie, wishing you every success with it.